How times change. There was a time I would never have thought of receiving a gift and in turn giving it to someone else as a gift. That just didn’t seem right. If I received something that I absolutely couldn’t live with, I either gave it away to a family member with practically a contract that they would never tell anyone that I did so. It’s very different today, especially in these frugal times. I put gifts that I will probably never use or wear in a special place in my closet. After all, they are brand new and still in their original boxes. The thing that changed my mind about not giving my gifts to others — it’s technically called re-gifting — happened while I was at an aunt’s house and she wanted to give me some Christmas towels that she ‘never used’. And she hadn’t. They were the loveliest red with crocheted red trim with embroidered gold Christmas designs on them. I happily took them home and when I unfolded them, there was deterioration going on from being in her closet so long. I decided then and there that I would find a home for my aberrant gifts. Some of the items that I decided to give to others: Sweaters and/or blouses that either were not my style or too big or too small. Some of these were presents from Italy (little likelihood this one would be uncovered by the ReGift Police). All had tags. Purses that were too big or too small. Handbags or purses are individual choices and you are either a big bag or smaller bag lady. How it fits on your shoulder is important, too. I would not give a handbag as a gift UNLESS I was with the person I bought it for and she had made drooling over it. 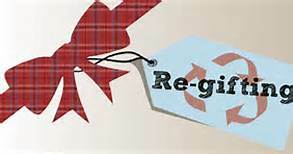 Otherwise, it can be regifted or donated. Always new tags on them. Same with colognes and perfumes which are even more of an individual choice. I use my favorite ones and am happy when I am gifted them; but sometimes I get powder sets, perfume, or cologne that I know does not go with my body chemistry and I try to regift them ASAP because they change in time and sometimes evaporate, so this is a necessary regift or donation – always in original box and not opened. Not even peeked at. I receive lots of planners, calendars, many picture frames, pen sets, figurines, vases, bedside clocks, manicure sets, and personal items that I already have lots of, and they are in my closet, too. I try to find a home for them. This is a BIG one. Christmas gifts in the shape of cookie jars – I have 4 already packed away and tree trimmings – I’m overbooked on the tree; Santa figurines and dishes; holiday tablecloths, ceramic holiday boxes, glasses, etc. I have these in the attic – they would take up the whole closet. They are up there year after year and why? Someone could be enjoying them, especially young families with kids who may not be able to afford them. These are still in original boxes – never used and look like they are from the store. Jewelry. I have enough Christmas pins to wear different ones a couple of times a month. I do have favorites and will never part with them, but many of them are still in their presentation boxes ready to belong to someone new. It seems strange giving something I did not buy to someone else as a gift. It was hard at first. I gave re-gifts as hostess gifts when we are invited out to dinner; hospital visits (cologne or powder); neighborhood shower gifts; thank you gifts; birthday party gifts; and Christmas visit or grab bag gifts. If the gift was a more expensive and inappropriate for the re-gift occasion, I donated it to a charity that asked for donations for auctions. I also have donated them for tricky-tray events and door prize gifts. I would have bought something at the store so why not donate something even nicer than what I would have bought. I make sure that I am careful who I re-gift to. I put a sticky on the gift when I got it and who gave it to me, because you can forget. And that would be a disaster if you gave it to someone in that same family or worse, back to the person. I try to give it to someone from a different group and even a different state. The gift has to be in ‘bought in a store’ condition with pristine box and and pristine condition. Otherwise, it’s not a gift. I never re-gift something from a thrift store or garage sale, because you just don’t know who donated it to them. I get lots of books because I love to read, and I never re-gift them. Although my books are in great shape – they are like family members to me – but a used book may have a stain somewhere through it if it were already read and then – it’s not a gift. I never give anything away that has been used. It has to be new and waiting…..for the new person to get it. Do I ever tell people it’s a re-gift. No – they don’t have to know. My most fun gifts to give away are the holiday ones. Especially with young children in the family who love Christmas dishes and candy dishes which I give with an additional gift of candy to fill it. I usually add something to each of my regifts, like this, maybe to feel like it is really a gift from me. Sometimes I add an ornament to the wrapping, or candies, or small trinkets that I wrap the gift in. Never give a regift in the original wrapping paper. Always make it look like a brand new gift which it is. Sometimes I get a gift that looks like a re-gift. You can tell because it is not anything you ever used, or talked about or had in your house or wore on your body. It is so off mark that it has to be. I always receive it gratefully – after all, it is a gift. And you don’t always know what financial situation the gift-giver is in, so, be gracious and sincere. It is a gift nevertheless. If it is something that I think can be given again, I do the sticky note and closet thing. If it is something that I truly find untasteful or would never give as a gift, it gets donated to the thrift shop. Make sure you take any tags off of that one and find a thrift shop that is not near your house, just in case. Someone else may love it and it’s better than its getting deteriorated in your closet. I enjoy giving gifts to people. My re-gifting allows me to give more gifts to more people. Sometimes, it’s a new tray with cookies to the nurses in the doctor’s office, or kept wrapped under the tree with tag of what it is in case someone stops over and brings me an unexpected gift. These aberrant gifts are gifts in themselves; they are a blessing in disguise when a gift is necessary ASAP or simply a pick-up for someone who was not expecting one. Can you guess how many poinsettias are sold in a year? Would you believe that last year more than 70 million were sold nationwide? Poinsettias accounted for one-third of sales of all flowering potted plants. So how did the poinsettia become the official flower of Christmas? December 12th is National Poinsettia Day and has been an official day since the mid-1980’s. The date was picked in honor of the man whom the plant is named for, Joel Roberts Poinsett who died on December 12, 1851 (1779-1851). A U.S. statesman born in Charleston, South Carolina, he was secretary of war under President Van Buren but is remembered most as the diplomat whom the poinsettia plant is named for. He became a legislator and then a member of Congress and eventually became a U.S. minister to Mexico from 1825- 1829. His interest as an amateur botanist led him to bring the plant from Mexico that was renamed for him. He discovered a shrub with brilliantly colored red leaves growing by the side of the road in Taxco, Mexico, in December 1828 and sent cuttings home to his plantation in Greenville, South Carolina. One Christmas Eve, Maria and Pablo set out for church to attend the service. On their way they picked some weeds growing along the roadside and decided to take them as their gift to the Baby Jesus in the manger scene. Of course, they were teased by other children when they arrived with their gift, but they said nothing for they knew they had given what they could. Maria and Pablo began placing the green plants around the manger and miraculously, the green top leaves turned into bright red petals, and soon the manger was surrounded by beautiful star-like flowers. Christmas would not be Christmas without the traditional poinsettia flowers somewhere in the house or by the fireplace. Did you know that the poinsettia’s main attraction is not its flowers, but its leaves? The flowers of the plant are the yellow clustered buds in the center (termed “cyathia”). The colored leafy parts are actually bracts or modified leaves, that turn color in response to the plant forming flowers. When buying a poinsettia, make sure it has the buds, preferably not yet open. Although every state in the United States grows poinsettias commercially, California is the top producer, followed by North Carolina, Texas, Florida and Ohio. At one time it was thought that this vibrant plant was poisonous, toxic and dangerous, especially to pets. It turned out to be a myth and not true. If you live in a cold area, make sure your newly-purchased poinsettia is protected from store to home and wrapped so. 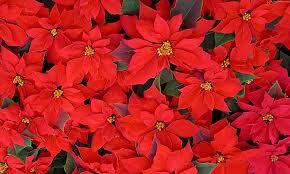 Poinsettias should be kept out of drafts, placed in a warm place and the soil kept evenly moist. After the colorful flowers (bracts) fall off, set the plant in a cool room and let the soil stay nearly dry until the spring. Then move to a sunny spot, water well and watch for new growth. Repot in new soil and cut back to 6 inches from the pot rim. Poinsettias can grow in a sunny interior or in a protected area outdoors. Pinch to encourage new branches so you will have more blooms. To assure holiday blooms, keep the plant in absolute darkness from sundown to sunup 10 weeks beginning in October. Ref: Encycopedia of House Plants; http://www.theholidayspot.com/christmas/history/flowers.htm ; http://www.annieshomepage.com ; Ref: http://www.landsteward.org.